Those words of St Thomas Aquinas encapsulate the essence of Dominican life – what it means to be a friar in the Order of Preachers. We are called to be men who live lives of profound and intimate prayer with God. By virtue of a life so lived, we are compelled to go and talk to others about God. That is what it means to be a preacher. It has however been pointed out, repeatedly, during our time here in Hong Kong that our prayer life – our contemplation, if we are so blessed by God – is not subordinated to apostolic activity, as a means is to an end. We are not to understand our prayer as a refreshing drink between sets which enables us to play the next round. Rather, our prayer is the cause of our apostolic activity. Our time spent kneeling in prayer with God prompts us to then stand up and begin talking to others about God. In the beautiful illustration employed by Fr William Hinnebusch, for a Dominican friar “the image of his life is a deep well”. “It fills slowly until its pure water reaches the top; then the water runs over the brim and begins to irrigate the whole countryside. Aside from developing this essential attitude of prayer, we have preaching practice sessions – as a matter of course – here in Hong Kong during our novitiate. We prepare homilies based upon the readings for the coming Sunday and deliver them to our fellow novices who then offer their critique. This practice will continue once we return to Australia in a few weeks – the student brothers deliver regular practice homilies to the brethren who then offer their words of wisdom in response. It is perhaps this sense of collegiality which most distinguishes the Dominican perspective and approach towards the preaching of the Word of God from other religious congregations and secular clergy. While all priests – hopefully – prepare and practise their preaching, for many it is a part of their ministry. For Dominicans, it is their ministry. Yet, as the Master of the Order pointed out to us when he visited the convent a short while ago: “We are not the Order of Homilists, we are the Order of Preachers”. Our “preaching” is by no means limited to the practice of homiletics – it ought to be a sense that pervades the whole of our religious lives. The priory is a living community of preachers who are forever critiquing, commenting, debating and formulating. Around the dinner table, during recreation, while washing up, the discussions promote and provoke further thought as to how people can be drawn to God. Last year the student brothers in the Melbourne priory created and published a Catholic Trivia app, which has hundreds of questions on “Catholic faith and Catholic culture”. I have been assured it did not materialise overnight – it took many painstaking hours and a great collaborative effort to put it all together – preaching in the age of the smart phone. The fraternal life of the priory is itself the crucible within which each preacher and his preaching are forged. Early Dominican priories were themselves called a Holy Preaching (sacra praedicatio) – the whole household, everybody, was understood to contribute towards and be responsible for whatever any of the brethren preached. At the High Mass of the fourth Sunday of Advent 1511, on the island of Hispaniola in the West Indies, Friar Antonio de Montesinos preached a coruscating sermon condemning the monstrous abuses perpetrated against the native population by the Spanish conquistadors. Unsurprisingly, the Spanish colonists were not impressed by this attitude – they went to the prior of the Dominican community and effectively told him to muzzle Antonio. In fact, the entire community had signed the sermon before it was delivered, to show that it represented their common sentiment, not simply that of Antonio alone. Each Dominican community is one preacher with many voices. In professing this understanding, however, no Dominican would ever claim that all the brethren are the same, or even similar. On the contrary, the raging differences in personality – some would say “eccentricity” – have become an almost proverbial mark of the order. Yet in living with them it has become clear to me that a life of common prayer has had a profound effect upon the fundamental attitude of these men towards life. The fact that our prayer ultimately tends towards apostolic activity seems to have had its own significant effect upon the spirituality of the order, and this is revealed in the friars themselves. Dominican spirituality is marked by a characteristic concern for the salvation of others, rather than that of the individual preaching friar himself. In helping – by the grace of God – to save others, we are saving ourselves. Thus absent from Dominican spirituality is the introspective hand-wringing that occasionally seems to be the principal focus of some congregations. 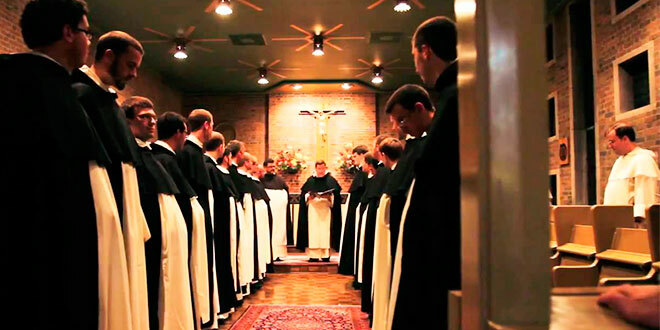 The spiritual “progress” that an individual friar has “made” is of comparatively little moment for a Dominican. This fundamentally trusting attitude towards the grace of God seems to be the source of a further common characteristic I have noticed during my time as a postulant and novice among the brethren – they are joyful men. St Dominic is described in the documents detailing his canonisation as a “joyful friar” and this gift continues to manifest itself in the order. There was a friar in Adelaide whose booming laughter will ever remain in my mind as a hallmark of my postulancy. The stories he told about various Dominicans he had lived with over the years invariably produced a similar response from us. Even during our classes here in the novitiate this sense of joy pervades the room. This is especially surprising given that the title apportioned to some of the classes might at first blush appear to render them inimical to any degree of mirth: “Religious Life in Canon Law” springs to mind as the prime candidate. Yet at some point, regardless of which class we are in or who is teaching, we invariably dissolve into laughter. Who knew that there was a joke to accompany almost every article in the Catechism? Or that History of the Order would be taught by a friar who could have made a successful living as a stand-up comic? The fact that he is Irish helps, no doubt. Emblematic of the entire order, St Thomas Aquinas even went so far as to write that those who are lacking in wit or mirth and who do not approve of the appropriate mirth of others are not only unpleasant company, but actually “morally unsound”. You can’t help but love Thomas. Encapsulating this exuberant sense of Dominican spirituality Fr Paul Murray writes that it is “not something tense or introverted or self-preoccupied, but rather joyous and expansive”. Our intimate prayer with God and the never-ending adventure that is community life together comprise a source of abundant grace. This grace, this source of immense joy, which can only be a gift of the Holy Spirit, percolates within the priory and then overflows and spreads the joy of the Gospel to others. We feel compelled to share our joy with others – to pass onto others the fruits of our contemplation. That is what it means to be a preacher. That is what it means to be a Dominican.